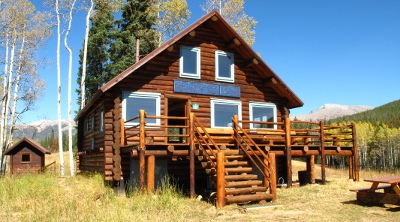 Built in 1986, Harry Gates Hut was the fourth structure added to the 10th Mountain system. It is the largest of the 10th Mountain owned huts, with two floors that can sleeps 16. Gates Hut windows look out on sunsets and spectacular Avalanche Ridge. The hut was built with funds from the Gates Foundation in memorial to the late Harry F. Gates, who was an outdoorsman with deep love for the mountains. Layout and capacity: 6 single beds downstairs, 2 private bedrooms upstairs with one double bed each, plus 6 beds in a communal sleeping area upstairs. Capacity 16. Parking/Route Changes for Harry Gates Hut: Please park in the parking lot located 3/10 of a mile downvalley at 26501 Fryingpan River Road (= 3/10 mile West of the old Diamond J). The parking is on the North side of the road. Please park in the designated area and do not block the driveway. Space is limited and carpooling is suggested. The main winter route into the Harry Gates Hut follows the Mongomery Flats Trail and FS 506 and is primarily rolling terrain with few steep climbs. Please note that the alignment of the first mile of trail to the Harry Gates Hut from the Montgomery Flats Trailhead has been changed. Hut visitors departing from the Montgomery Flats Trailhead (located approximately 26 miles up the Fryingpan Road from Basalt) will now access the trail by skiing 200 yards northwest (downvalley) from the parking area to the old corral, then heading north (uphill). The new route is marked with blue diamonds but patience and diligent route-finding skills will be useful. This new alignment is located entirely on public US Forest Service lands. Please be aware of nearby private lands and respect private property. 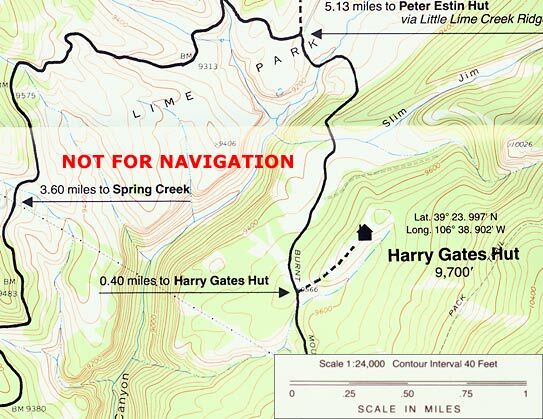 During the summer the Harry Gates Hut can be reached either by driving in on FS 400 (Spring Creek Road) or FS 506 (Burnt Mountain Road) to the summer closure gate, approximately 1/3 mile from the hut. Please be aware that FS 400 can be extremely slick and dangerous when wet. There is no established summer hiking trail to this hut. Vehicle access is never guaranteed to any hut at any time. The numerous hiking trails in the area that lead to Tellerium Park, the top of Burnt Mountain and towards Woods Lake. There is also good fishing to be had at Crooked Creek Reservoir.